Have yourself a very Muppet Christmas with this all-new holiday movie starring Kermit the Frog, Miss Piggy and the whole Muppet gang - plus a celebrity cast featuring David Arquette, Joan Cusack and Whoopi Goldberg, with cameos by Michael Lillard, William H. Macy, Carson Daly, Kelly Ripa, Joe Rogan, Molly Shannon and the cast of "Scrubs"! 'Tis the night before Christmas, and the Muppet theater is in danger of being torn down. And when bad goes to worse, Kermit begins to believe the world would be a better place if he'd never been born. But don't worry! With heavenly help and hilarious send-ups of just about every holiday movie ever made, Kermit and the Muppets discover what matters most is their love for each other. Featuring showstopping musical numbers like "Moulin Scrooge!" (starring Miss Piggy as "Saltine"), this "charming and clever" ('The San Diego Union-Tribune') holiday classic will have the whole family laughing! I should start off by saying that I am a bit partial to The Muppets. I grew up watching Sesame Street and The Muppet Show. I have loved the Muppets since I was a child and I still love them. Basically, if The Muppets are involved, I'm watching. That being said, I did enjoy this movie overall, though it wasn't as good as earlier Muppet movies. This one was made for television a few years ago. I liked how the movie was a version of It's a Wonderful Life. Without Kermit, poor Miss Piggy ended up pretending to be a psychic with an apartment full of cats..She was a crazy cat lady..or pig I guess. lol Anyway, the movie was entertaining and had a decent message about what is really important without being too preachy like can happen with some movies. Joan Cusack was really good as the bad guy who was tring to take over the Muppet Theater. Some of the characters didn't have as much to do, which was a little disappointing. Since I have seen so much Muppet stuff, I did really notice that more of the characters didn't sound the same since other people took over performing. The characters did still act the same though. Some of the voices were just slightly different while one or two were much more different. Bolt - no picture for this one. I'm using it as my O entry. Bolt is a cute dog that appears in a television show. In the, he has all sorts of cool super powers that he uses to save Penny, his person. Bolt doesn't know he is on a tv show though and thinks he really has powers and that everything that happened was real. When an episode ended with a cliff hanger with Penny in danger, Bolt thought she really was in danger and he was determined to save her. While trying to find her, he ended up being shipped to New York City and he had to try to find his way back to Hollywood with the help of Mittens the cat and Rhino the hamster. This was a really cute, well done animated movie. I don't know for sure, but I think this might be the first one to be developed after John Lassiter - of Pixar - was put in charge of all animation at Disney after Eisner finally got the boot. Lassiter served as a producer on this one. I think his influence made the movie stronger and certain elements did have much more impact. Yes the story was predictable, but it was still very entertaining. There was a lot of humor, especially once Bolt started to accept certain things and Mittens was teaching him how to beg or even just to play. The movie did have a few more emotional scenes as well that did work very well with what was going on. The animation was very well done, though not quite as good as what Pixar has been doing. The voices all fit the characters very well, especially John Travolta as Bolt. Overall, I really enjoyed this movie and I'm sure I'll add the DVD to my collection eventually. Now I have to get a longer review done to post at Epinions..the holiday has me a little behind. Academy Award® nominee Edward Norton stars as scientist Bruce Banner, a man who has been living in shadows, scouring the planet for an antidote to the unbridled force of rage within him: the Hulk. But when the military masterminds who dream of exploiting his powers force him back to civilization, he finds himself coming face to face with his most formidable foe: the Abomination - a nightmarish beast of pure aggression whose powers match the Hulk's own! Also starring Liv Tyler, Oscar® nominee Tim Roth, and Oscar® winner William Hurt, The Incredible Hulk is "steeped in action and spectacular special effects" (Claudia Puig, USA Today) and delivers a mind-blowing final showdown that can only be summed up with one word... INCREDIBLE! I'm using this for my U entry. 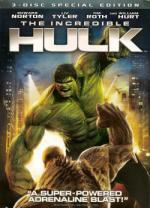 I did see Hulk after it was out on DVD. I didn't hate it like so many seemed to, but I didn't love it either. There were just too many things about that one that didn't work for me, especially the main villain of the movie. The Incredible Hulk was so much better on every level. The casting seemed to fit better, the story was stronger and more logical, and there was an actual villain from the comics used..plus there was set up for a future villain as well. I wasn't sure what to think when I heard this movie was going to basically ignore the other movie, but I think it worked doing that. The origin story - which wasn't shown in a lot of detail - just worked better even though it was different from the comic books. It was more like what had been done in the television show. I use to watch that show all the time and I really liked it. I really don't remember a lot from it now, but I did read and see some interviews back before this opened in June that there was an attempt to make the movie more like the tv show since that had been so popular. I also read about how Edward Norton had been a fan of the show and worked on the script to make some of the changes so it was more like the show. I did remember some things that were clearly from the show..like how his eyes would turn green first and how he was always on the move alone. I think there were some other things as well that I can't remember. I felt like the connection and story with Bruce and Betty worked better this time as well. The special effects worked better and looked better overall as well. Yes things were unbelievable, but that worked with the movie. I also really liked how there was a little bit of a connection to Iron Man and more hints of what is to come from Marvel movies. I think what Marvel are about to attempt is huge. I'd love to see it work, but really, is it too big? I know they have a lot planned. I think if they they do it right - like they did with Iron Man and The Incredible Hulk - it can work. A lot of fans have wanted to see an Avengers movie for a long time, so I can see why they are planning for it. And I think it makes more sense to introduce some of the characters first. It will be nice that in the future movies, other characters can be mentioned or even pop up like has been going on in the comic books for years. I did get more movies watched that fit for this marathon. I just haven't had time to write up little reviews about them. I may do that for at least a few of the last one I watched in the next day or so. I have to watch one more to finish.